If we elect new Public Service Commissioners and legislators this year, one or both of the Georgia legs could get revoked. And if we lobby Congress and the federal government, maybe that federal loan guarantee, which apparently has never been finalized, might never get finalized. Then we could stop pouring money down that rathole on the Savannah River and get on with efficiency, wind power, and solar power, both utility scale, such as GaSU's 90MW proposal, and distributed rooftop, such as Austin Energy pioneered way back in 2003. If Cobb EMC can switch from coal to solar, Georgia Power and Southern Company can switch from nuclear to efficiency, wind, and solar. Georgia Power's additional 210 MW solar is a move in the right direction, but still a baby step. 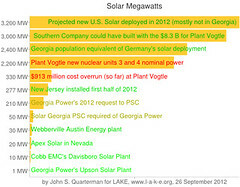 We'll know SO and Georgia Power are serious about when they stop getting in the way of changing the 1973 Georgia Territorial Electric Service Act catching up with the rest of country and the world that currently only permits you to sell power you generate to your one and only electric utility at whatever rate that utility has set. We need to change that law so in Georgia like in most states we can have a real energy market. Kick one of the legs out from under that three-legged regulatory capture stool and the nuke boondoggle will collapse, leaving SO and Georgia Power no excuse. Then the clean energy sun can rise on Georgia. PS 2012-10-02 10PM: Here's a list of the legislators who voted for CWIP. Consider voting for their opponents. You don't even have to wait for November. If you're a Georgia Power customer, you can pay your CWIP payment in a separate check, with a comment saying you'd rather have renewable energy. Even if you're not, you can write to Georgia Power, or Southern Company, or the GA PSC. Here are some contacts.